Every time too much time passes between posts, I wonder if I even remember how to log in. I’m just not going to tell you. Right now. But I will in a minute. In a eyebrow-furrowing cross between guilt and love, I have just spent the last 30 seconds of my life outside. While I was out there, I decided to celebrate my little accomplishments. So I took a deep breath, and thought of all the things I still remember how to do. Remarkable. I have been writing. Still remember how to do hand writing. On paper. I have been painting, too. Just not daily. But still painting. Just not telling the world about it. Not necessarily because I want to, but mostly because it’s easier. Not to. With new glorious involvements in my life, such as the ART life, my creative being has become so rich and full, that I have forgotten to remember that I can type words on my blog. So here is one to appease the giants. Motivation? I met with a couple other writers tonight and thoroughly enjoyed the clashing of swords playing with each other, and I am feeling optimistic and hopeful. And was reminded that I had a blog. That I like. I actually didn’t know I had this in me…but when it came out, there was a sense of relief and joy so full it only made sense that it had actually been there all along. You see, my mom had breast cancer. Twice. And now that she is on the mend again, there is a different side of cancer journey that I am experiencing alongside her: it is the sound of healing. I have done the violent “FIGHTER” painting to depict the strength it takes to endure the process, but this was equally as needed. There is hope. Every time feels like the first time. In a way, it was a first. This was the first work that came out of my new studio, so I am feeling sentimental about it. I find myself wishing I could keep it around for a little while longer, but it will be going to its new home in a few short weeks. In my new studio, there is a tiny rounded patio, only for the purpose of romance in my opinion…because I swing open the doors while I paint and push the music and inspiration outside with my brush and voice. The title for this painting came out in a moment just like that. I sang. I painted. And I was moved to tears, so now I am eagerly preparing the special message for the new owner. At this time, it seems, the dragonfly is able to communicate something that is inside of me that needs to be expressed. And there is more on its way. 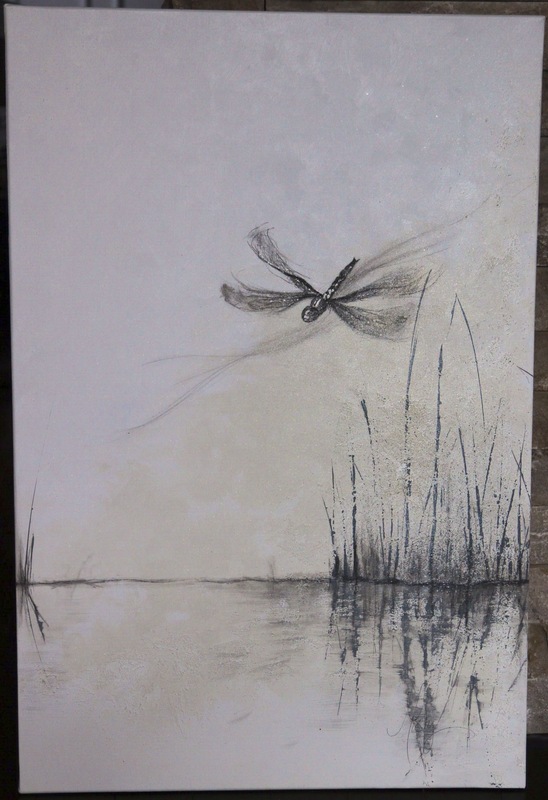 More dragonflies, more paintings, more people…I nod my head in understanding something I cannot yet see. Two years. That is how long most species of dragonfly spend in the “preparation stage” for life: a stage that ends in only a few short months of flying. But that ability to fly is full developed, expert, complete with the ability to catch their prey in mid-air with their feet. How do they do that? Well, nearly all of the dragonfly’s head is made up of eye…so their vision enables them to see every angle, except for behind them. 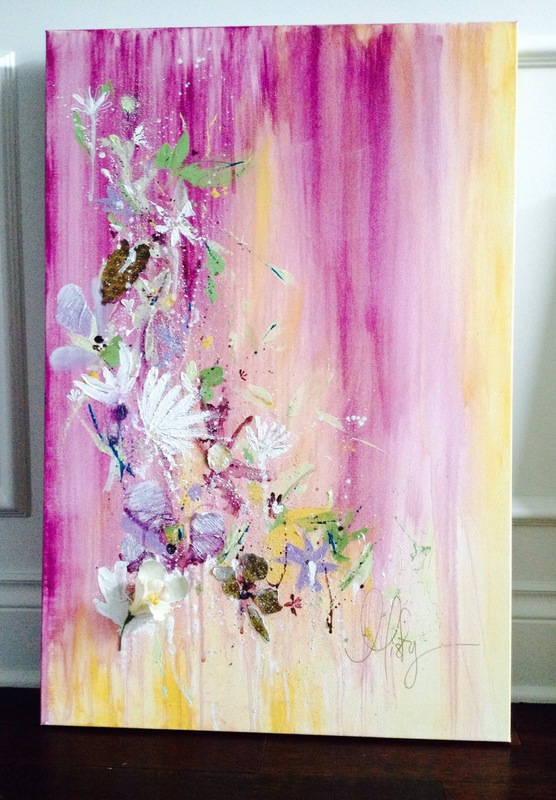 >This painting will be available at the After Dark Gala at The Abbotsford Reach on September 13, 2014 with 100% of the proceeds going to The Reach to further the community of art in Abbotsford. There are times when we think and hope and pray, and we are convinced we know what God has in mind. (In spite of myself, I do this.) In the shadows of the unkown, some may assume confirmation that He can’t hear us, doesn’t know us, and doesn’t care. We grow cold. 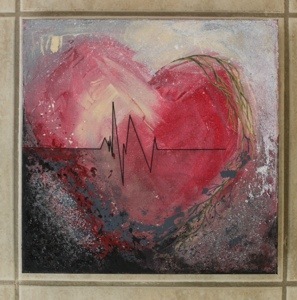 This painting reflects the cold and dark areas of our hearts that we don’t like to acknowledge. But He does see us. It’s not how we assume it is. His plans are not like our plans. We may think we know what He wants, but God responds to what actually is best for us. Believing this truth revives our hearts. This painting also reflects the growth of believing His promises for us. This weekend, His promises were revealed to me, and I had a choice. Would I doubt His plans or would I respond to them, even though they were different from my own? Lord, make my heart fully Yours. My plans do not truly matter at all…only Yours do. I don’t have many words to go along with this painting. It speaks for itself. The title, is a prayer; the painting…the answer.